1盎司2015年认识和准备银盾半精制银圆 This limited production round reminds us that it is possible to be awake and aware even if others slumber. In the words of the creator of the round, Chris Duane, "To be truly aware and prepared in the land of sheep and home of the wolves, one must find the divine balance between love and aggression. To nurture your land and people with love, caring and empathy. As well as prepared to face any threat with divine will and aggression." 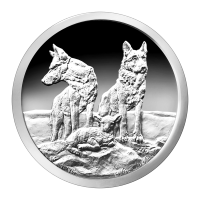 This round was only in production for two months, complete your Silver Shield collection today.